In addition to main stream sudoku puzzles, we can also produce sudoku puzzles specifically aimed at children and the younger puzzle playing market. There are a variety of options available. 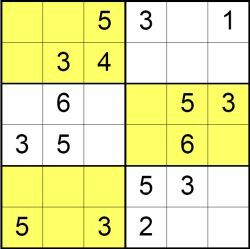 Particularly popular with children and novice puzzle players are our smaller sudoku puzzles, that use a 6 x 6 grid rather than a 9 x 9 grid. This results in a sudoku puzzle that requires you to fit the numbers 1 - 6 in each row, column and 3 x 2 box and is therefore quicker and a little easier to complete. You can choose a fill colour of your choice, or a standard black and white puzzle. We can also provide standard size sudoku puzzles but set at varying degrees of difficulty to solve; and can make them as easy to solve as you require. Finally we can produce custom tailored sudoku puzzles for magazines or activity books; for instance replacing the numbers 1 - 6 with smiley faces or simple shapes and so on. There really are many options with customising puzzles and particularly sudoku puzzles for children and for kids puzzle books. Standardly all puzzles are provided in the popular PDF format and all Children's sudoku puzzles come complete with matching solution. Other formats are available on request. We can meet a Children's sudoku puzzle order of any size with quick turnaround times. Simply Let us know your requirements, and we'll come back to you as soon as possible with a quote and timescales to fulfil your order for the puzzles. Another popular version for Children is the very colourful Colour Sudoku - here rather than the numbers 1 - 6, six different colours must be placed once per row or column. 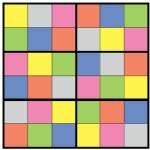 View sample Colour Sudoku PDF. Contact us about children's sudoku. Publishers - Please contact us to buy Childrens Sudoku puzzles for publication in your book, magazine, newspaper, any other printed media or online.